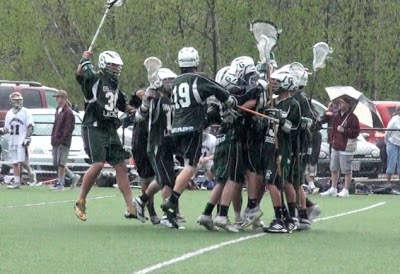 Grafton celebrates a huge win over Algonquin. This past week was not kind to the defending Central Mass champs. A close loss to Grafton was compounded by a 14-4 defeat at the hands of state power Acton-Boxborough. Suddenly, Algonquin is sitting on five losses with Shrewsbury and St. John's coming to town this week. It certainly seems like gut check time for the wounded Tomahawks. Meanwhile, St. John's proved it's not just a Central Mass title contender. The Pioneers may be the best Division II team in the state. After beating Eastern Mass power Xaverian Bros. on May 2nd, the Pioneers continued their stellar play away from Central Mass, beating reigning Western Mass champion Minnechaug last Tuesday 9-5. Westboro's 14-4 victory over Shrewsbury nearly shot the Rangers into the No. 4 spot, but they came back down to Earth, losing to a sneaky good Nashoba team this past Friday. So, despite the fact that Westboro dominated the Colonials, Shrewsbury holds onto the fourth spot in our rankings after they rolled over Wachusett and Tantasqua. As of right now, Longmeadow is the heavy favorite in Western Mass and St. John's looks like the top team in CMass. That means we could see these two again in the state semi-finals, but St. John's would love to pick a win up here against Division II's most dominant team. It should be an interesting matchup, as Longmeadow's stingy defense allows only four goals a game, while the Pioneers score 11.5 each time out. Something has to give. The short-handed Tomahawks have a huge week coming up with a trip to Nashoba Tuesday, and home games against Shrewsbury and St. John's the rest of the week. While the game against St. John's may be more anticipated, the T-Hawks need to get back on track, and can ill afford a loss to league foe Shrewsbury. The Colonials are dealing with some injury issues themselves, but their defense seems to have bounced back well from last week's letdown against Westboro. Basically, both teams need a big win bad for their psyches, and this game presents a huge opportunity for each of them. Rotatori played like an All American last week against Algonquin, scoring four goals and dishing out a pair of assists against the T-Hawks. With less than 10 seconds to play, the senior midfielder threw in an insurance goal to help Grafton knock off the team that had eliminated it from the postseason the last three years. Along with fellow All American Tyler Reilly, Rotatori has Grafton poised to contend for a Central Mass crown.